There are a lot of things American astronauts and Russian cosmonauts have in common  not the least being a certain nonchalance about where and when they urinate. Alan Shepard, the first American in space, famously relieved himself inside his silver pressure suit while waiting out the countdown in his tiny Mercury capsule  a far better solution than canceling the launch and pulling him out just because no one had thought he'd need the loo during a 15-minute suborbital mission, and his spacesuit thus had no collection bag built in. Apollo astronauts used a somewhat more elegant funnel-and-tube system; then they would gather at the window as their waste was vented into space, where it would explode into a shower of shimmery crystals that Apollo 7 commander Wally Schirra dubbed "the Constellation Urion." But it was Yuri Gagarin, who became the first human being in space 50 years ago today, who got the urinary tradition started. On his way to the launchpad, he stopped to relieve himself against the rear tire of his transport van  then climbed back inside and later rocketed off to fame and glory. There was surely no cause and effect between the voiding and the flying, but pilots can be a superstitious lot and all cosmonauts since  or the men at least  have observed the same tire-dousing ritual on their way to the pad. 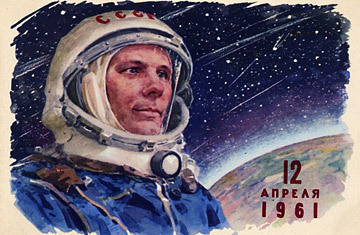 The 27-year-old Gagarin was a hard guy not to love, and not just for coming up with so venerable a good-luck ritual. There was his apolitically sunny smile, his postage-stamp-ready face, his just-right mix of bravado and modesty, evident to Soviet psychologists who observed in a written report that he "embarrasses when his humor gets a little too racy." Neither Gagarin's small stature  he stood just 5 ft. 2 in. (1.57 m), the better to fit inside the tiny pod that was the Vostok spacecraft  nor the brevity of his space career, which spanned just a single, 98-minute orbit, dimmed his radiance a whit. And when he died young  losing his life in a crash of his fighter jet during a routine training mission just seven years after his ride in space  he ensured himself the forever-beautiful icon status of James Dean, John F. Kennedy and Marilyn Monroe before him, and Princess Diana and John F. Kennedy Jr. after. Just as inevitably, the 50th anniversary has gotten the revisionists going, questioning not only what the point of human space travel is when unmanned probes can go so much farther so much more cheaply (a fair, if spiritless, question) but also just how big a deal Gagarin's little joyride was in the first place  a wholly unfair one. Stipulate this: Gagarin was indeed mostly along for the ride: his Vostok capsule was controlled entirely by either preprogrammed commands or controllers on the ground. He was not even allowed the dignity of an attitude-control joystick, unlike John Glenn, who became the first American to orbit the Earth 10 months later and who could at least change the orientation of his little Mercury spacecraft, practicing a rudimentary form of the complex flying that later space travelers would have to master. Stipulate too that even in the most modern, state-of-the-art spacecraft, orbiting any body  the Earth, the moon, Mars  is a largely passive act. Once you achieve the right speed and altitude, physics does all the flying. But consider too what it meant to go first  before Shepard, before Glenn, before any other human breached the boundary of space. Even serious scientists could not say for sure that sustained weightlessness wouldn't cause blood pressure to spike, the heart to lose its natural rhythms, the vestibular system to come completely unsprung, the eyes to swell and  yes  explode. The cosmonauts themselves could not say if they could survive the possible 10-G load they'd experience on re-entry  a force making the average 150-lb. (68 kg) man feel like he weighed 1,500 lb. (680 kg). What's more, nobody could say if the giant A-1 rocket with the four strap-on boosters that carried Gagarin to orbit wouldn't blow up along the way  something that rockets had a nasty tendency to do in the early days of the space program. Even in the later days, no launch vehicle was ever considered entirely trustworthy or safe. Jim Lovell, the commander of Apollo 13, was also part of the crew of Apollo 8, which not only was the first manned mission to orbit the moon, but also  more relevant to the astronauts' immediate survival  the first to use the massive Saturn V rocket. For Lovell, the most striking moment of launch day occurred when he and crewmates Frank Borman and Bill Anders rode the elevator to the top of the 363-ft. (111 m) booster and looked down at the ground below, where nearly every other human being within a 1-mile (1.6 km) radius had been evacuated. NASA wanted as few people as possible anywhere near its infernal machine with its 6 million lb. (2.7 million kg) of explosive fuel, and yet Borman, Lovell and Anders were sitting directly on top of it. "I kept thinking, do they know something they're not telling us?" Lovell says, from the safe remove of 43 years. But back in 1961, there was nothing not to tell because there was so little that was genuinely known. It was Gagarin who had the spine to go up and find out, and he would pay a high price for that. Like America's Glenn, he was officially  but quietly  grounded after his return from orbit, the space agencies of both countries deciding that they could not afford the risk of losing a national hero in a second mission when his first had gone so well. Gagarin's face would appear on coins and statues and posters and pennants  and later on T-shirts and tattoos and all the rest. But the man himself would forever be denied the thing he did  and loved  best. He would die at age 34, a terrestrial creature like the rest of us. Think about that fact on Yuri's Night this year  and give a nod of thanks to the man who gave it all up to be first in line. See "The Labor of Space Exploration."